Five years ago I posted this Hand Sanitizer recipe on an old blog and it is still a huge hit. Thought I would share here for those who haven’t seen it! This recipe is, well, so simple! I’m about to head out of the house and want my family to do all they can to stay healthy. 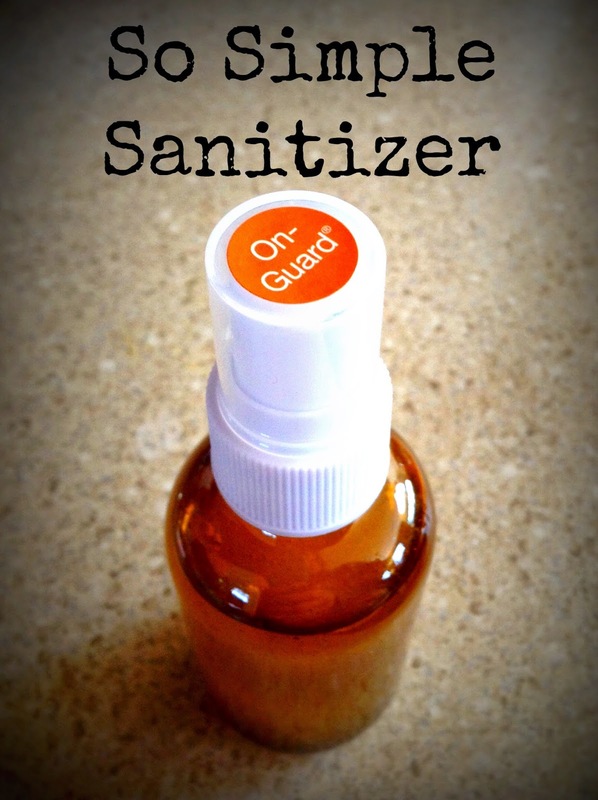 This So Simple Sanitizer is a great thing to keep on hand this time of the year. To make: Add 1 tablespoon aloe vera gel and 20 drops of OnGuard essential oil blend from doTERRA into a small spray bottle. Next fill the rest with water. Replace cap and shake, shake, shake! That’s it! Seriously. To use: Shake well and then apply 3-5 sprays on dry hands. Rub well. Want to see more DIY recipes? Check out these Facial Cleansing Rounds made with Lavender & Tea Tree! Make your own all-natural Gingerbread Sugar Scrub. Quick, easy and make a great Holiday gift! Instructions: Combine all ingredients in a 4-ounce jar. Top with an extra splash of fractionated coconut oil before sealing. Please like & subscribe DIYparenting on YouTube to be notified when we release the next DIYoiler Video. Don’t forget, more meal plans can be found on Organization Junkies Menu Plan Monday page. For more meal planning ideas, hop on over to Organizing Junkies Menu Plan Monday page. While many students are spending their Spring counting down the days of school remaining, our family is readjusting. Always with the readjusting. A few years back we made the decision to forgo the traditional 9-month, 5-day-a-week school year to instead pursue year-round schooling. Before you start groaning, hear me out. In our home state of Pennsylvania, our schooling requirement is 180 days. Achieving 180 days in nine months can be cumbersome and– let’s face it– pretty boring. It can be especially difficult when days at home simply cannot be 100% focused on traditional lessons. Most days are also laden with housework, caring for younger children and many, many unscheduled distractions. To attempt 180 days in nine months can leave even the most organized family feeling frazzled. One “simple” change– switching to a year-round model– can be so [so] much more relaxed and enjoyable. It has led us to adopt a life-is-school mentality, which we absolutely love. Instead of cramming lessons & “learning” into 38 weeks, we now have the entire 52 weeks to accomplish the same thing and more. Can you tell I’m a fan?? All that to say, here’s why, in April, we are changing things up and coming up with a new schedule. A little prep work can go a long way. That’s why we’ve decided to devote this day to just that. Everyone gets involved as we scoop, measure, peel and chop our way through the day. We also tidy our common spaces of the house and make sure we complete enough laundry to get us through the week. Today is for getting serious. Sorta. We pull out our books and bunker down for the day. We allow ourselves to get immersed in reading and math because the entire day is carved out for just that. We are big fans of RightStart and enjoy many math games and interactive learning strategies. The rest of the time you’ll likely find us with our noses in some books. This is one of the places we plug Science & History/Geography into our weeks. But instead of forcing the kids to learn a certain topic, I encourage them to learn about what interests them. My son has studied farming; my daughter China and now Africa. In the Spring and Summer they’ll research plants and get hands on learning in the garden. The possibilities are endless and we’ve seen much fruit allowing the kids a say in what they’re learning. The older kids pitch in to help teach our 2-year-old & Kindergartener basics like coloring, shapes, letters and music in the morning. Though math practice and worksheets occur all week long, Thursday includes another scheduled math lesson with mom in the afternoon. For sanity’s sake, our schedule must include built-in day for friends, field trips and service. We like to keep Fridays super flexible (hence the name). We know how important it is to get out there in the world and be with other people whether for building up, learning or serving. Some Saturdays we do extra lessons around the breakfast table, other times we work on our garden. We use Saturdays however we see fit and I’m not at all opposed to using it as a “school” day! Sundays are great because our whole family is together. We often wind up reading, visiting with friends & family or, lately, catching up on an episode of Drive Thru History. And, if you’re not needing a scheduling change quite yet but are already thinking about SUMMER, check out our summer schedule from last year. 2. In a medium bowl mix together all ingredients except blueberries. 3. After stirring well until combined, fold in the blueberries. 4. Grease muffin pan with coconut oil. 5. Scoop muffin batter into pan, filling each slot about 1/2 full. 6. Bake for 18-20 minutes or until slightly browned. Adapted from this recipe at simplytaralynn.com. I remember it like it was yesterday– turning 16, learning to drive and getting my first car. I was thrilled with the new freedoms and possibilities but perhaps what I was even more thrilled with was the fact that I now, officially, had a reason to own a cell phone. My parents hesitated but eventually approved so long as I paid for the service myself. It was a barebones Nokia (you know Generation Y’ers know the one) and texting wasn’t yet a thing but I was still beyond excited with this little blue piece of technology. It meant I could call people– mainly my friends and boyfriend– from anywhere. Amazing. At the same time that I was celebrating my newfound coolness, I was also getting a first taste of social media. Of course, we didn’t call it that, we didn’t even realize that’s what it was but… it was. ICQ and AIM (@jenEbean) became a way to connect with my friends (and boyfriend @joeEbear) after school, so long as we had enough minutes left on our dial-up internet plan. So weird, I know. I also wrote a good bit of emails from my razzberry mail account. I was #killingit. But life didn’t stop there. Many a weekends were still spent at high school football games and late night runs to Wendy’s for French fries and Frosties… all while we remained happily disconnected, technologically-speaking. Life was much simpler then, and not just because I was a teenager, but because most of our daily interaction with people took place In Real Life. Fast forward nearly 20 years, we interact with one another so much more– with likes and thumbs ups and filter-laden selfies–yet majority of us are lonely, anxious and searching (read: scrolling). We spend evenings catching up on our friends’ IG feeds instead of picking up the phone to ask them how their life is going. We answer with emojis because our friends can’t see our expressions or know our hearts behind the keyboard. And somehow we think winks, thumbs ups and hearts are a suitable replacement for IRL smiles, hugs and tear-soaked shoulders. I’m here to tell you that they are not. Yes, they can be a temporary, quick solution when life circumstances truly prevent IRL relations but they will never stand as an equivalent replacement for real human touch and laughter and quality time. I enjoy social media, email, blogs, YouTube, text messages, video chat as much as the next person. And maybe even more so because I fell in love with my then-boyfriend-now-husband Joe over ICQ after he wooed me by sending me a flower (which, young people, was literally realized by the words, “joeEbear has sent you a flower” coming up in the chat box). However, today, more than ever, this world has a community-problem. We isolate ourselves like never before. And in the moments that we can be engaged in IRL community, we’re interrupted by dings and rings and other, often-unimportant notifications. I believe that the first step toward change is to recognize there is a problem. Check. The second step? Do something about it. So here I am, trying to fight the overbearing pull from those temporal, pseudo-communities that can eat up all of my free time and swallow it whole. I am, instead, trying to exchange my time for IRL relationships that so desperately need pouring into. I’ve also been thinking about what this looks like for the next generation. I’m working on writing a post “how to raise the next generation so they are not social media addicts” (or something to that effect). Look for it up soon. In closing, I feel the need to say THANK YOU for being part of my online network of friends, I appreciate you and I enjoy your company… just don’t let me or any other internet-based community steal all of your time or replace your IRL relationships. Your community needs you!